You may draw amusement from the rhythmic sounds little Joe makes in his sleep. He is probably the subject of one of your Youtube videos. Humor aside, your child’s loud snores are probably not merely humorous. They usually signal a deeper health concern. You will need to cut off the wheezing sounds that your child makes at night. Before you can do this, grasp the reasons for his snores and find out how they may affect everyone around him. You will also need to decide which snoring devices will suit his needs. Many parents brush off snoring as a charming oddity, deeming it “normal.” The truth is that it is anything but. Snoring is, often, directly related to sleep apnea. It can have other causes as well. Sleep apnea refers to having more breathing pauses during sleep. These breathing pauses can last anywhere from a few seconds to ten minutes. It has a few causes. Obstructive Sleep Apnea (OSA), or breathing pauses resulting from blocked air passages, may cause snoring. With an increasingly affluent lifestyle, many children are becoming overweight. Many studies suggest a link between Obstructive Sleep Apnea (OSA) and Childhood Obesity. Obesity causes snoring, because excess weight presses on the child’s neck. This narrows his breathing passages and prevents air from flowing through them. This leads to breathing problems and snoring. According to experts, apnea is a common childhood health disorder which affects roughly 5 to 6% of children. Pediatric sleep expert and member of the National Sleep Foundation’s Board of Directors, Jodi F Mindell, suggests that the number of children suffering from sleep apnea is likely to increase, since the rate of obesity is increasing. Children who have facial or pharyngeal abnormalities, such as elongated palates, elongated tongues or pushed in jaws are at risk of developing OSA. These facial structures relax and collapse during sleep, blocking the airway and making it difficult for air to flow through. Breathing difficulties and snoring result. Some children have what the medical world calls a deviated septum, or in simpler terms, a crooked nose. While the image of this is a source of amusement, it has more serious implications. A crooked septum may block nasal passages and make it difficult for air to pass through them. Experts share that a crooked septum causes nasal congestion and mucus build-up that may block air flow. This results in annoying snores. 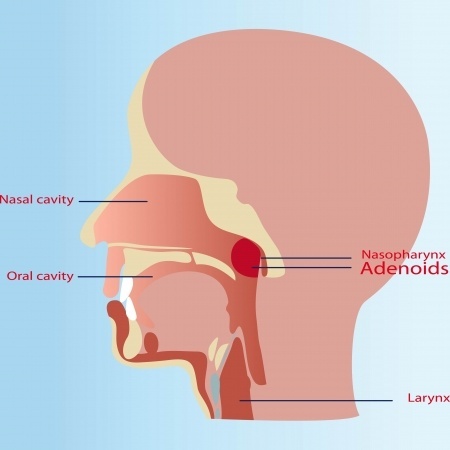 Tonsils are the lymph nodes at the back of the throat, while adenoids are the lymph nodes found where the nose meets the throat. Both guard the child from bacteria. Enlarged tonsils and adenoids are a common childhood ailment. They usually arise because of infection, but are sometimes normal. Either way, they cause breathing difficulties. If they cause airway obstruction at night, snoring may result. OSA may not necessarily trigger your child’s snores. He may experience “normal” or primary snoring which is often temporary and not related to apnea at all. Stress and fatigue may cause temporary snoring. The airway’s muscles becomes more relaxed, causing the tongue or palate to fall back and block it. Children, who are now digitally inclined and use computers often, are more likely to snore. Research suggests that heavy use of both computers and mobile devices increase the links between snoring and stress. Snoring troubles are also signs of defects in the respiratory system. Experts believe that respiratory infections, such as colds, allergies or flu-like illnesses can trigger temporary snoring. When an infection occurs, mucus blocks the airway. It inflames the child’s nose, causing it to become stuffed up. The mucus blocks the airway temporarily, causing turbulence and wheezing noises as air passes through air passages. Though such snoring is not a long-term concern, it is disturbing if it happens often. if your child’s snoring and related illnesses persist, do consult a doctor. Your child may show signs of normal, or primary snoring if he makes heavy breathing noises during the night. To explain why this happens, it is useful to understand a little about sleep. Experts distinguish two types of sleep, namely Rapid Eye Movement and Non-Rapid Eye Movement rest. The first, of course, is when a person’s eyes move quickly as he sleeps, and the other when they do not at all. Both have four stages. Snoring associated with sleep apnea happens more readily during the third and fourth stages of non-REM sleep, as this is when airway and skeletal muscles relax and collapse. It is less likely to happen during REM sleep, as the airway is effectively paralysed. Paralysis usually occurs during REM sleep. If your child suffers from REM sleep behavior disorder, paralysis usually does not take place. Symptoms of this disorder include yelling, punching or kicking during violent dreams. Your child may become irritable and suffer from mood swings. His personality is probably nothing like this. Doctors often prescribe medication to keep this disorder in check. If your child sleeps restlessly, he may suffer from Periodic Limb Movement disorder. When he gets up, he may become drowsy and his limbs, limp. This disorder is usually a sign of iron deficiency. Doctors treat it with iron supplements. Sleep paralysis, a frightening phenomenon, may happen as your child goes into deep sleep or just before he awakens. The child remains immobile, as there a few ways he can respond to his brain’s commands. Your child may also feel that a strange entity in his room is pressing down on him. Children who experience sleep paralysis regularly must have regular rest and relaxation. Hypersomnia is a rare disorder which affects less than 1% of children, usually preteens. Young people who suffer from hypersomnia sleep for more than 10 hours a day. There is tendency for muscles to relax and snoring to occur. Doctors may prescribe antidepressants. Insomnia in children is slightly different from insomnia in adults. The causes are different for both. While adults may find it difficult to sleep because they have sinus allergies, chronic pain or arthritis, children may need psychological testing to decide if there are underlying causes like Attention Hyperactivity Deficit Disorder (ADHD), or the inability to pay attention for long periods. The symptoms of insomnia in children, which include irritability, mood swings and hyperactivity, often mirror those of ADHD. Known as sleep talking, Somniloquy is a common childhood sleep disorder. It disturbs the sleep quality of a child and his family. Though it seldom needs treatment, it is probably a sign of a more serious condition. This refers to the brain’s inability to control sleep-wake cycles. Children with Narcolepsy may have fleeting urges to sleep during the day. Conversely, they may suffer from insomnia at regular bed times. Narcolepsy may interfere with your child’s cognitive development and success at school. Pediatricians usually recommend medications that will restore the nervous system’s functions. Related to Soniloquy, Somnambulism is sleep talking. Children may walk during their sleep but not remember doing so. Doctors recommend relaxation and locking the doors and windows. Children exposed to horror films may suffer from nightmares. If screaming, enlarged pupils or cold sweats happen too often, they will disrupt your child’s sleep and cause behavioral disorders. To keep this in check, give your child a security object or turn a night-light on in his bedroom. Children who stay awake for at least two hours past their bed times may have Delayed Sleep Phase Syndrome (DSPS). They fall asleep later and awake later than usual. Snoring occurs in children in the same way it does for adults. Air, passing through airways blocked by awkward facial structures or mucus, cause loud snores. This said, note that Upper Airway Resistance Syndrome may cause your child’s snoring. Experts define it as snoring that is enough to disrupt sleep quality. It causes daytime sleepiness, morning headaches, a dry mouth and insomnia, symptoms similar to those of obstructive sleep apnea. However, this does not mean that obstruction causes the snoring. The symptoms in UARs are less severe in children than in adults. They worsen as the child grows older. Young babies and children may simply breathe loudly and turn about restlessly as they sleep, while older children and adolescents may have pain on top of these symptoms. Adults would have impaired psychomotor performance. You may find it difficult to tell when your child’s cute snores are a symptom of bigger problems. Experts tell parents to look out for these signs. Watch out for breathing difficulties. Your child may break out in cold sweats, and his ribcage may move in and out vigorously. These are signs that he finds it difficult to breathe during sleep. Your child may shift about as he sleeps, assuming different positions. If your child has apnea, he may constantly try to extend his neck. This opens his airway. The poor oxygen flow leads to raised blood pressure and headaches. To add, your child may wet the bed often or have difficulty paying attention in school. Teachers may complain about his hyperactivity. If doctors have diagnosed your child for hypertension, consult a sleep expert. He may have sleep apnea as well. Apart from disrupting the sleep patterns of the family, children who snore will display more behavioral problems. Dr. Dean Beebe, a neuropsychologist at the Cincinnati Children’s Medical Center, studied toddlers aged between two and three. Researchers tracked 249 children and their parents when they were two, then three. They got parents to complete surveys on the behavioural problems of their children. A small number (22) snored persistently. They found that the children who snored habitually showed tendencies like hyperactivity or depression. Researchers at the Albert Einstein College of Medicine tracked the health of 11000 children. In the same way, their parents filled out questionnaires about their behavior. The researchers found that 50% of these children snored persistently. These children developed behavioral problems by age 7. If your child’s snoring problem is not severe, you may want to consider stopping it via the most natural and least invasive way possible. Should he have more serious snoring issues, you may consider using anti-snoring devices to help him. There are many fairly effortless ways to stop your child’s snores. Most of them need some guidance on your part as a parent. To start, change the way your child sleeps. Place him on his side, and not his back. Sleeping on the back may cause his tongue and palate to fall backwards and block his airway. There is less chance of neck extension if he sleeps on his side. Run a dehumidifier or air vaporizer in your child’s room to clear the air of allergens and other congestants. This will help your child if he is prone to developing allergies. Change your child’s pillowcases regularly to remove allergens. If your child is obese, help him to lose weight, as excess weight around his neck will press on his airway and stop air from flowing. Encourage good sleep hygiene. Sleeping early will lessen daytime sleepiness. There are many anti-snoring devices available on the market to help your child, so you have many choices. This also means that you are more responsible for choosing the right device for him. These are devices worn across the chin and looped behind the ears. Simple and unobtrusive, such devices will help your child if he has a jaw that is not well-aligned. Chin straps are useful if your child snores on occasion. A child who snores excessively should use more technical devices, like Mandibular Advancement Devices (MADs). Nasal Strips, placed across the nose, relieve nasal congestion by opening up nasal passages. A nasal strip consists of two parallel plastic bands on a soft pad. It lifts the outside of the nose, thus opening the nasal valve and passages. Nasal strips will work well for your child if his snoring stems from allergic reactions. MADs are devices, worn in the mouth, hold the tongue and lower jaw forward. This will give your child space to breathe and restrict his snores. 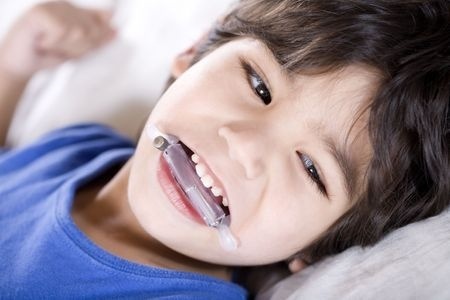 Such a device will help your child if he snores because his tongue tends to collapse over his airway. If he wears braces, they may get in its way. The VitalSleep Mouthpiece is an ideal example of a Mandibular Advancement Device, It holds the lower jaw forward and keeps the airway open with a flexible frame. The micro-fiber alignment supports the jaw gently, so it is safe for your child to use. Side to side mobility makes it comfortable for him to wear while he sleeps. The device comes in a smaller size for women. Children may get a one fitted, using the Boil and Bite method. Tongue Stabilizing Devices, or TSDs, hold the tongue and pulling it forward slightly. This keeps your child’s tongue from falling back. It is useful if your child suffers from an elongated tongue that covers his airway persistently. A device made by Zyppah is a hybrid of both MADs and TSDs. The device pushes your jaw forward and opens the airway slightly. Patent binding plastic stabilizes the tongue. This will help a child who snores because of an elongated tongue, a soft palate that is too long or an awkwardly aligned jaw. It is suitable if he has moderate to severe snoring problems. CPAP works by applying pressure on your child’s airway to keep it open. Doctors do this with the help of a mask attached to a CPAP driver. A little cap holds the mask in place. 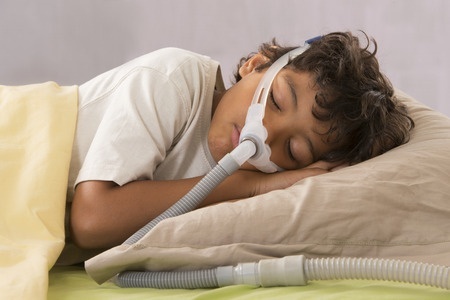 CPAP is effective for children who have sleep disorders. It reduces headaches and daytime sleepiness that result from their conditions. That said, it may take time for your child to become used to his mask. Understanding the causes and effects of snoring will keep the wheezing noises that your child makes in check. Find a solution among the various types of anti-snoring devices available. CPAP or Anti-Snoring Devices – Which Treatment is Right for You?